In February 2017, 8,000 jobs were created in Saskatchewan (up 1.4 per cent, the highest growth rate in the country). 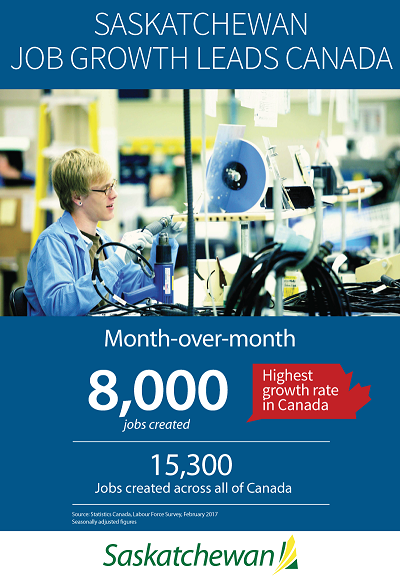 Nationally, employment was up 15,300 (up 0.1 per cent, seasonally adjusted) from January. More people were employed in Saskatchewan in February than ever before with 563,600 working in our province. Saskatchewan’s seasonally adjusted unemployment rate was 6.0 per cent in February, the third lowest among the provinces. Nationally, the unemployment rate was 6.6 per cent. Employment was up by 8,600 over February 2016. Full time employment was up 3,300 over last year, and part time employment was up 5,300. Major year-over-year gains were reported for trade, up 7,800; professional, scientific and technical services, up 4,800; educational services, up 4,500; and manufacturing up 3,000. Off-reserve Aboriginal employment was up 4,400 (10.0 per cent) for eight consecutive months of year-over-year increases. Aboriginal youth employment was up 1,000 (+11.9 per cent) for 10 consecutive months of year-over-year increases. Regina’s employment was up 2,900 (+2.1 per cent), and Saskatoon’s employment was up 1,600 (+1.0 per cent) compared to last February. Youth unemployment rate was 10.3 per cent (seasonally adjusted), second lowest among the provinces, behind British Columbia (8.7 per cent) and below the national rate of 12.4 per cent. Harrison noted that while the strong employment numbers are very encouraging, Saskatchewan is still facing a challenging fiscal situation due to resource revenues being down well over a billion dollars. “While our economy is gaining strength, there will still have to be some difficult measures taken in the upcoming budget to address the resource revenue shortfall, to return the budget to balance and to keep Saskatchewan strong,” Harrison said.